Still having issues with the iPhone 5 purple flare that seems to show up on photos taken with a bright light source nearby? Today we’ve got an update straight from Apple. A purplish or other colored flare, haze, or spot is imaged from out-of-scene bright light sources during still image or video capture. Most small cameras, including those in every generation of iPhone, may exhibit some form of flare at the edge of the frame when capturing an image with out-of-scene light sources. This can happen when a light source is positioned at an angle (usually just outside the field of view) so that it causes a reflection off the surfaces inside the camera module and onto the camera sensor. Moving the camera slightly to change the position at which the bright light is entering the lens, or shielding the lens with your hand, should minimize or eliminate the effect. There you have it. Apple is still saying that you’re using the camera wrong; the whole iPhone 5 purple flare issue can be avoided by angling your phone’s camera differently. Granted, purple flare is not unique to the iPhone 5, but the problem just seems more pronounced when compared to its predecessor or other smartphones. 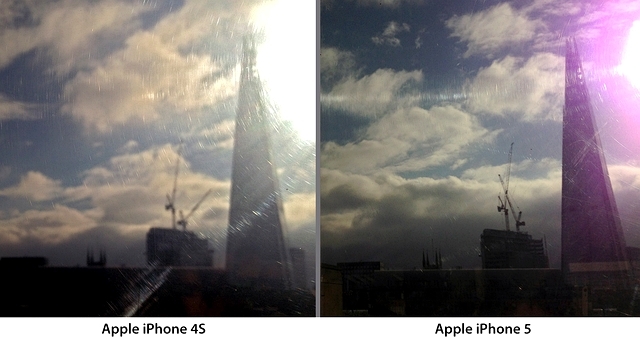 This apparently is the reason why there are quite a few iPhone 5 users concerned. Is iPhone 5 purple flare an issue? Or do you think it’s something being blown out of proportion? Share your thoughts in the comments below!